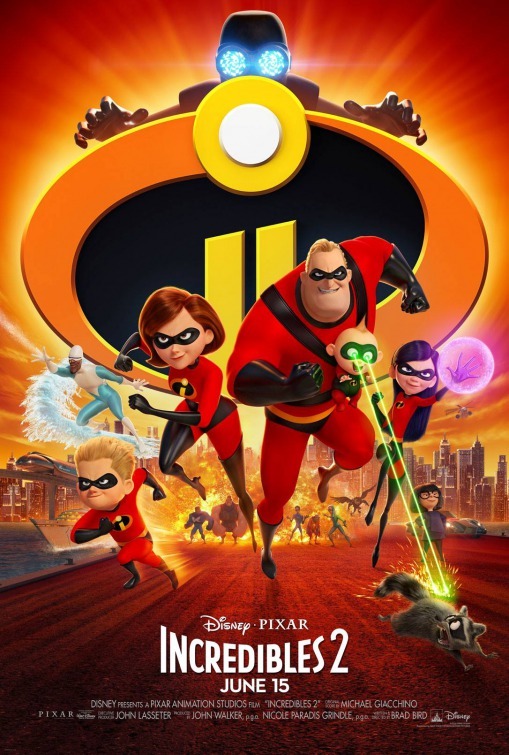 After a 14 year wait, Incredibles 2 is finally here. Mr. Incredible is left to care for the children while Elastigirl goes out to save the world. Incredibles 2 stars the voices of Craig T. Nelson, Holly Hunter, and Samuel L. Jackson. 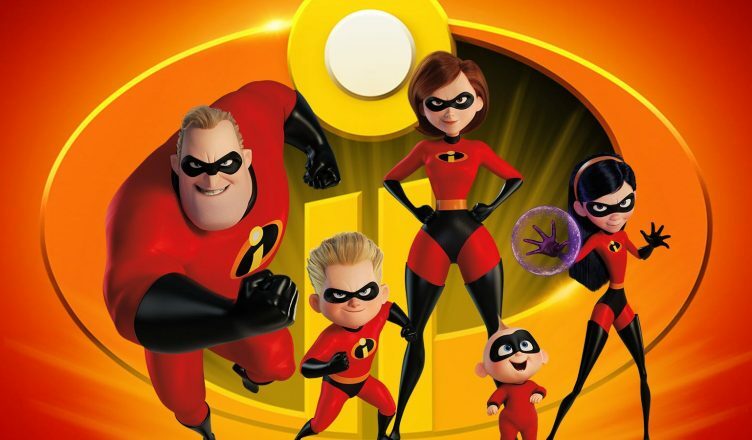 Despite the long 14 year wait, Incredibles 2 picks up at a point where you’ll feel as though you had recently seen the movie. In a similar fashion, this sequel does an even better job of furthering the superhero setting and atmosphere. The introduction to new characters, the history of heroes in that world, and their societal impact really helps to immerse us into this universe. It was especially refreshing to see how this movie was able to address a number of various themes. We get to see the dichotomy between being moral versus being law-abiding. Although, I do wish that element was emphasized a bit more, the film makes an adequate attempt of displaying just how difficult it can be when the law may (or may not) conflict with what’s deemed as morally right. Beyond that, I especially appreciated the additional perspective explored through the lens of parenting. The film brilliantly shows both the ups and downs for parents raising their children, and the fact that those children just so happen to have superpowers is just secondary. All of that helps to preserve the relateability of the story to the audience, and even if this may superficially appear to be a “kid’s movie”, it’s a part of the film that parents will certainly appreciate. I don’t think that I’d be over stating this when I say that Incredibles 2 probably had the best superhero action sequences in a superhero movie. The cinematography and choreography of the action sequences were done especially well. I can’t recall another movie where super powers were displayed in such an engaging and captivating manner. The villain in this story was a very formidable threat, and posed a great challenge to the heroes in this story. That in itself keeps the level of suspense at a high given the fact that nothing was too easy for the heroes to face. Speaking of superhero powers, Jack Jack is by far the scene stealer of the entire movie. He was simply hilarious and easily will be the fan-favorite of the characters. Aside from him, it was great to see Samuel L. Jackson’s character (Frozone) get a bigger role. The only thing I’d probably say that could’ve been improved was the predictability of villain. While the film does try to give the appearance of a major twist, you’ll be able to predict who/what the villain may be pretty early on. So as a result, you’re just going to be waiting on the film to catch up with what you already know. Now this isn’t the worst thing in the world, but while it does take a while for the film to reach this minor twist, there’s still plenty more of the movie to finish off in a strong way. Incredibles 2 was worth the wait for sure. I can’t say that it was better than the first Incredibles, but that’s only because of the originality factor that came with the first one. It’s hard to recapture or exceed that magical feeling of seeing something new and unique as the first Incredibles presented itself to be. However, Incredibles 2 is such a worthy sequel that it certainly warrants another sequel to become a bigger franchise. There’s no doubt that this film should be seen in theaters, and a special treat for families to watch this weekend too. Incredibles 2 is in theaters now. Be sure to follow E-Man’s Movie Reviews on Facebook, Subscribe on YouTube, or follow me on Twitter/IG @EmansReviews for even more movie news and reviews!